The mutarotation of carbohydrates in aqueous phase was first reported in 1846 by Dubrunfaut. The finding further expanded to the chemistry of intramolecular reaction of an aldehyde and a hydroxyl group that caused isomerization at the anomeric position. Anomericity is of critical importance in carbohydrate industry, and thus has been the specific issue to be studied in analytical chemistry. Even with the recent advances of mass spectrometry in ionization, structural elucidation and sensitivity, resolving anomeric configurations is still an inherent and formidable task because the molecules are isobaric. 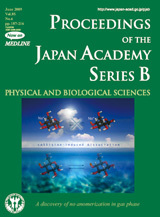 The cover illustration of this issue shows an image of interconversion process of anomers of a carbohydrate. In the article on page 204-215 of this issue, Dr. Kanie and his colleagues reveal that these anomers do not isomerize in gas phase in mass spectrometers, in contrast to the fact that anomerization takes place in aqueous solution. Based on this feature, they demonstrate that the individual anomers of lactose hemiacetals display distinguishable dissociation profiles, which are obtained by a technique energy-resolved mass spectrometry (ERMS) utilizing collision-induced ion activation. Furthermore, they extend the technology to stage-discriminated ERMS and succeed in monitoring mutarotation of lactose in aqueous phase and delineating the mechanism of endo-glycosylceramidase.